I feel so privileged to have Dr Andrea Bonior contribute to Heads Shoulders Knees this month. Dr Bonior is a mum, a clinical psychologist and a writer. She is a integral part of the faculty over at Georgetown University, where she has been for over ten years. She’s made a career of translating the science of psychology into meaningful, real-life change, and it’s taken her from therapy rooms to classrooms, from convention rooms to newsrooms, and everywhere in between. 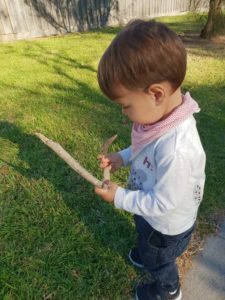 In her piece today, she shares her thoughts on why children should be allowed to play with sticks and why we should encourage it in fact! I am a huge advocate for this so I can’t wait for you to have a read! It’s a real thought provoker more than anything else. 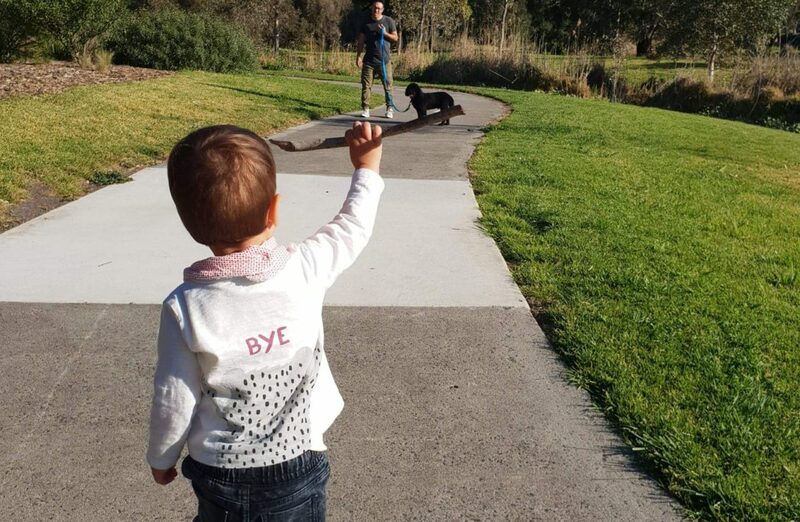 Is it really so awful to let a young kid wield a stick? Maybe it’s their pretend fishing pole (seen it), their implement for digging for treasure (seen it), their triumphant torch declaring their sense of Olympian-like immortality, if only for a fleeting moment (most definitely seen it). Somehow, instead, to parents monitoring the playground, it might as well be a firearm. 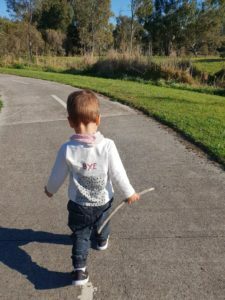 There seems to be some sort of zero-tolerance policy for sticks these days, one I’ve cringed at and that seems to be getting worse over the seven years I’ve been clocking in at playgrounds. The more we teach our kids that nature is dangerous, creativity is out of bounds and physicality is not to be tolerated, the more I worry for our society. We’re fine with children hammering their thumbs on whatever acronym-laden device we’ve bought for them to make sure they stay quiet and their clothes stay clean. (Ah, for the days when “Leapfrog” was an actual physical game, actually played outside, rather than a gadget designed to keep them sedentary!) But let them grab something that helps them learn balance, respect other’s space and create a world of pretend play — and yes, just might be a bit dirty and prickly — and we act like they’re on their way to juvenile delinquency. I’m certainly not on board with letting things degenerate into Lord of the Flies reenactments. And I’ve definitely had to intervene more than once when a stick was used to threaten, or to simulate a weapon or in a full-contact swordfight. Yes, it takes energy to help kids learn where to draw the line. Tantalizingly, an all-or-none approach would sometimes let my bottom find its way back to the park bench a lot more quickly; it’s a heck of a lot easier and more convenient to forget the gradations and just declare no. But let’s not pretend that means it’s better for our kids. So, in my idealized playground, we bring on the sticks. And the dirt. And the puddles (yup, I’m one of those Moms too.) It’s well worth the effort and the OxiClean. And as far as the danger? I’m betting the long-term effects of staring at screens are a heck of a lot scarier. Andrea Bonior, Ph.D., is the author of two books: The Friendship Fix: The Complete Guide to Choosing, Losing, and Keeping Up With Your Friends, and the recent Publisher’s Weekly Bestseller, Psychology: Essential Thinkers, Classic Theories, and How They Inform Your World. In addition, she writes Psychology Today’s “Friendship 2.0” blog, which has been read more than 8 million times, and she is the longtime writer of Baggage Check, the mental health advice column in the Washington Post Express. And please leave a comment to share your thoughts on this interesting idea!